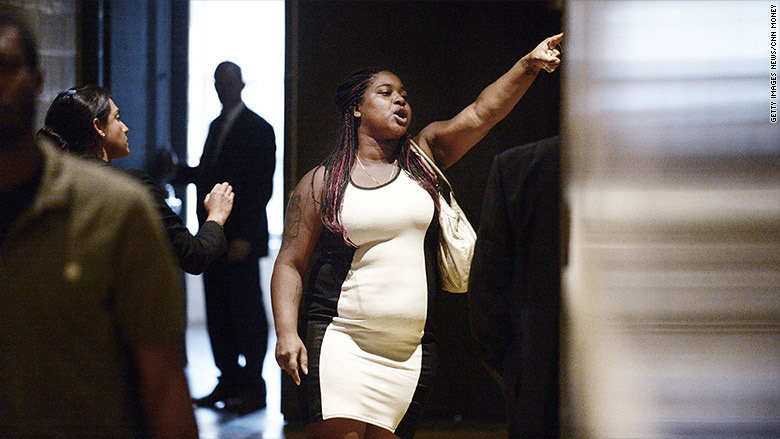 ABC News is in big trouble with Eric Garner's daughter. Erica Garner, the daughter of the African-American man who died after being placed in a chokehold by New York City police, was reportedly seen shouting after ABC News did not give her the opportunity to ask a question at a town hall event with President Obama on Thursday. "I was railroaded! I was railroaded by ABC on the two-year anniversary of my father's death!" Garner could be heard yelling, according to the pool report from the event. Garner said she'd been offered a chance by ABC News to ask the president a question but did not get to do so: "They liars," she could be heard saying, according to the television pool tape. "They got us all the way down here." The town hall, titled "The President and the People: A National Conversation," was moderated by "World News Tonight" anchor David Muir. It will air Thursday night at 8 p.m. ET on ABC, ESPN and several of Disney's digital platforms. In a statement, ABC News said that President Obama did speak with Garner following the event. "We took an extra 30 minutes to get to as many people as we could during the town hall," the network's statement read. "The President spoke to several people after the event ended, including at length with Erica Garner. " White House Press Secretary Josh Earnest also released a statement confirming that the president spoke with Garner. "After the ABC-hosted townhall that was taped this afternoon, the President had a brief opportunity to visit with Erica Garner who was upset that she didn't get called on to ask a question," he said. Garner's one-on-one with the president hardly changed her attitude toward ABC, however. "This town hall that presidential town hall #abc arranged is a farce. It was nothing short of full exploitation of Black pain and grief," she tweeted on Thursday. "They lied to me and my family to get us to travel to DC to participate. Taking time away from things I had planned to remember my father." "I went there trying to represent THE PEOPLE... #ABC wanted ratings even if it meant they had to profit from Black misery and oppression," she added. "I was not upset about not speaking with [the President]. I was upset because #ABC lied and used me, my pain, and suffering for ratings." Eric Garner died two years ago in Staten Island, New York, after an NYPD officer put him in a chokehold while trying to arrest him. His death was one of several that have stoked national outrage over police treatment of African-Americans.